Pennsylvania has very specific, enumerated laws regarding bicyclists and the requirements one has to meet in order to ride one on public roads. However, even if a bicyclist observes all the laws, they may still meet with an accident. If you have been through this situation, you may be entitled to seek compensation for your injuries, especially if you can show that whomever hit you was acting recklessly or negligently. 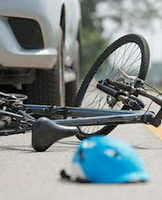 In Pennsylvania, bicycle accident victims are usually covered by the auto insurance belonging to the driver that struck them or otherwise caused the accident. If you are a bicyclist injured by an auto driver, his insurer will be the one paying your bills, assuming that their liability can be proven. However, it is important to keep in mind that, their choice in auto insurance is irrelevant to you. Pennsylvania’s Department of Transportation puts out a Bicycle Driver’s Manual, which contains all the relevant laws that someone needs to be aware of before riding a bicycle on public roads. The most important one is that bicycles are vehicles – they are not pedestrians, legally. Also, the Manual states explicitly that bicyclists must obey all the same rules of the road as automobile drivers do, and a failure to do so may affect your right to recover if you are injured. In other states, bicycles are classed as pedestrians due to their lack of a motor, and the rules are different for them – for example, bicycles may not have to stop at lights or may ride in the road as opposed to on the shoulder or sidewalk. Despite the specificity of Pennsylvania’s bicycle regulations, it is important to understand that if you violate one or more, this does not automatically preclude recovery if you have been injured. Pennsylvania upholds a common-law concept called comparative negligence, which holds that unless your percentage of fault is greater than the defendant’s (or defendants’, in cases with more than one), you may still recover. Your award will simply be diminished by your percentage of fault – if, for example, you are deemed to have been 30 percent at fault, any award you received from your lawsuit would be lowered by 30 percent. Bicyclists are more likely to be injured in accidents with vehicles, simply because of their relative lack of protection. If you have been in a bicycle accident, you likely have some significant medical bills that may need paying, and enlisting an experienced bike accident lawyer may get you the recompense you need to pay them, so you can get on with your life. The Needle Law Firm has handled these cases for years, and we are happy to sit down with you and try to help with yours. Call our Scranton office today for a free consultation.